Early details and photos of Sony&apos;s first foray into the tablet arena first leaked several months ago, but now the venerable tech giant has finally made it official. The twin tablets, a 10-incher now called the "S," and a foldable, dual-screen 5.5 inch number called the "P" (for "pocket") were unveiled at the IFA conference today and the "S" is available for pre-order now. Both tablets run the latest version of Android Honeycomb, are compatible with some PlayStation games and can act as a universal remote. 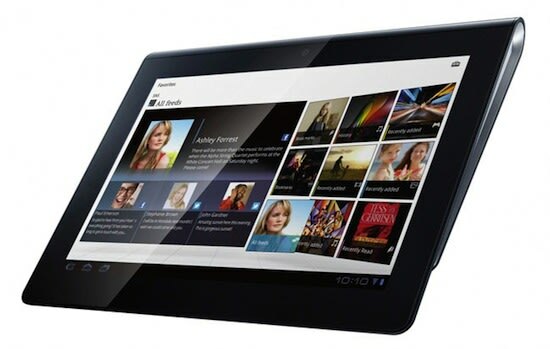 The Sony Tablet S comes in 16gb and 32gb models, costing $499 and $599 respectively. It can&apos;t connect with a cellular network and is WiFi only. Pre-orders today will ship in mid September when the device is scheduled to hit stores. The Sony Tablet P is not yet available for preorder and pricing is unknown, but it will offer 4G data service via AT&T when it ships later this year.